7 babies in this family! I hope you enjoy these fuzzy babies as much as I did when we saw these up in Post Falls, Idaho, during mother’s day weekend. The parents were very attentive to their brood! Honk, honk! What is you favorite baby creature? Very nice. How do you get the ‘Monet’ effect on the water? Thank you! I used pic monkey to edit a little! 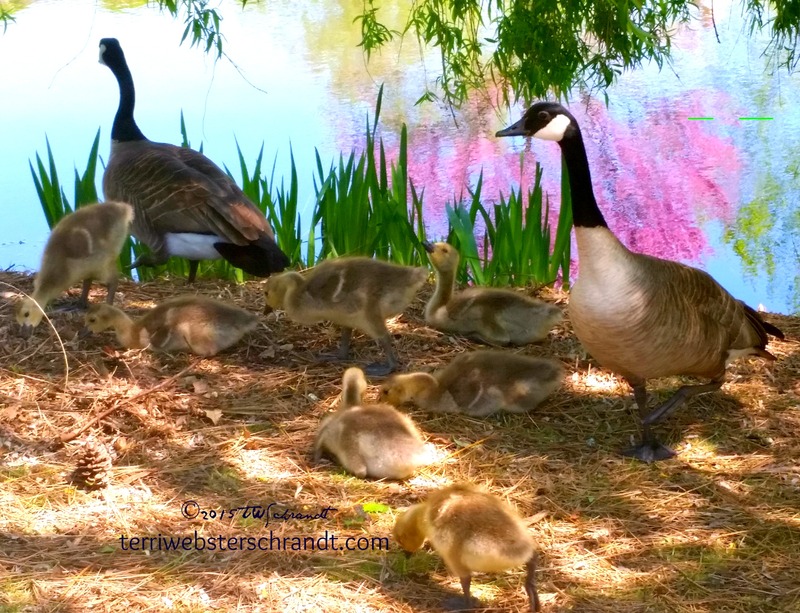 Oh, how cute are these goslings? You captured a very cute pic! My favorite baby animals are baby bunnies…They are adorable! Thank you!! Oh, bunnies, they are ridiculously cute!!! Thanks. Baby Turtles with their indomitable will making their life or death rush (at turtle speed!) to the welcoming sea. Regards thom. Baby otters. I love pretty much every baby animal, but baby otters make me squeal like a 4 year-old. They’re so cute. 🙂 I don’t think I could pick a favourite baby creature. They all make my hear melt. Adorable. I see them in Saddle River Park sometimes. Hard to say — so many cute ones. Guess I’d have to say baby kittens and baby large cats, but all are so cute. Has to be puppies, but that’s because I’ve got Toby, and remember what he was like as a puppy…gorgeous! Oh yes, puppies! and kittens, and… LOL! It’s difficult to pick one favorite baby animal but goats and lambs are up there on my list.